Nobody will believe these moist and delicious cupcakes are gluten-free and low-fat. They aren't overpoweringly sweet like so many cupcakes out there, which is one of my favorite things about them. Preheat oven to 350. Lightly oil 2 muffin pans, or fill with paper liners. Whisk together dry ingredients in large bowl. In a medium-sized bowl whisk together pumpkin, non-dairy milk, vanilla, lemon juice and molasses until smooth. Add wet ingredients to dry and stir until combined and most of the lumps are gone. Scoop into muffin cups. Bake 18-20 minutes, moving individual muffins to cooling rack once removed from the oven. Cool completely before frosting. To make frosting, combine Tofutti Better Than Cream Cheese (in the yellow and white tub. The blue one is hydrogenated - stay away! ), maple syrup and vanilla. You may mix by hand, but I like the whipped texture you get from using a mixer. I used my KitchenAid Stand Mixer but a hand mixer would work too. If you don't care to make these cupcakes gluten-free, whole wheat pastry flour should work just fine. Use 1 TBS pumpkin pie spice if you'd rather not bother measuring out the cinnamon, nutmeg, allspice, ginger and cloves. 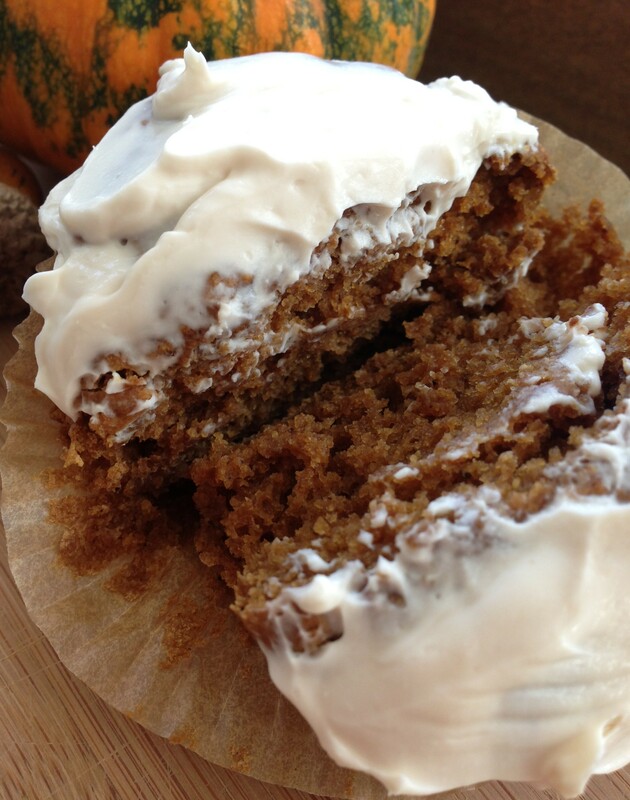 This entry was posted in Blog, Recipes and tagged cream cheese, cupcake, gluten-free, low-fat, oil-free, pumpkin, vegan by Shelly Detken. Bookmark the permalink.